The top of the Rensselaerville Falls at the Huyck Preserve. We've been a little waterfall-crazy lately. There's just something about walking through the woods and coming upon that whoosh of water as it falls over rocks. And with the leaves just starting to turn, now is a great time to check out a few. After the jump, a handful of local waterfalls that are worth a look. Important: Waterfalls -- being tall, wet and made of rocks -- can be dangerous. Stay on the marked trails and obey the rules. Also, good shoes are never a bad idea. Have fun. OK, so we're starting with one that's super close and pretty well known. But have you have ever taken the time to stop and see the Cohoes Falls? We're always surprised to hear how many people haven't. You totally should check them out. 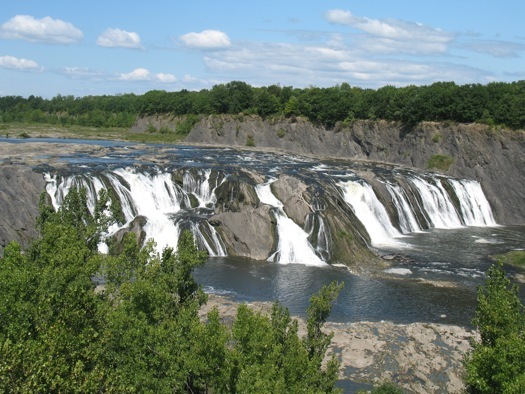 Located just upstream of downtown Cohoes, the Cohoes Falls are an impressive sight. Believe it or not, Europeans visiting the United States once made it a point to stop in Cohoes and see the falls. They're that impressive -- the biggest falls east of Niagara. Even so, it had been kind of hard to get a good look the falls -- until Falls View Park opened in 2008. And the lower level of the park offers an even better look (though, sometimes it's closed when the water level is up). 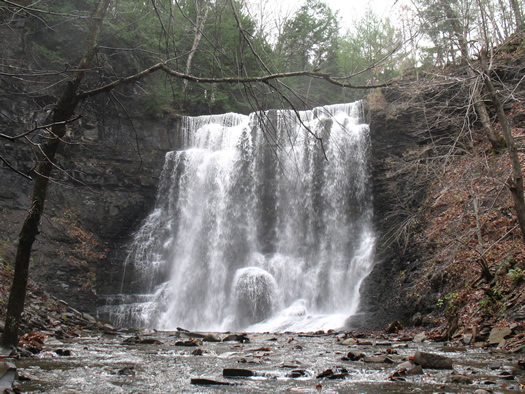 This beautiful 90-foot waterfall in Rensselaer County is on the Poesten Kill. The stream drains the 35 square mile Rensselaer Plateau, so there's usually a good amount of water. It's remarkable how the hidden it is -- driving the adjacent roads, you'd never know such a spot was a short walk nearby. Important: One half of this waterfall is on Nature Conservancy land and the other half belongs to a private homeowner. There is access via the Nature Conservancy trail on Blue Factory Road. There's a parking cutout on Plank Road across from the cemetery -- walk along the road to get to the trail head. Do not access the site from the other side. Law enforcement does patrol the area and crossing the private land could very well get you prosecuted for trespassing. An impressive gorge runs through the The Plotterkill Preserve in Rotterdam -- and there are three waterfalls in the gorge. Big waterfalls -- one is 60 feet tall and the other two are 40 feet. The Plotterkill doesn't seem to flow hard all the time -- your best bet is the spring when it's draining snow melt -- but the gorge and falls are impressive even without much water. The main trails are a pretty easy hike, but getting down into the gorge is more challenging (no joke, it's steep). It's fun to walk along the bottom of the gorge, though -- and coming across one of the falls sort of makes you feel like Indian Jones. There are two trailheads for the Plotterkill. If you want to see the falls, the best bet is the Mariaville Road entrance. As we've mentioned before, the Huyck Preserve in Rensselaerville is a beautiful piece of land. It's one of our favorite places for a walk. 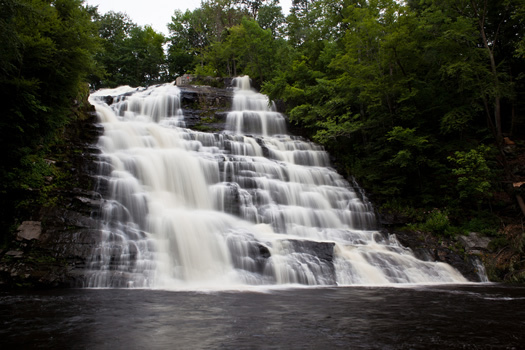 And the Rensselaerville Falls just make it that much better. The falls have multiple cascades. The lower portion is an easy five minute walk from the preserve's parking lot. It takes about 20 minutes or so to walk around to the top of the 60 foot falls, where there's a bridge and observation platform. This one is a little farther afield, but it's totally worth the trip. 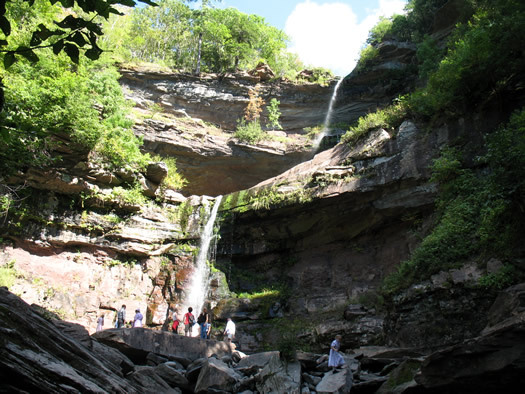 The Kaaterskill Falls are in the Catskills in Greene County. And they're tall. Really tall. The two-drop falls total 260 feet. They're a very impressive site. Washington Irving mentions it in Rip Van Winkle. And it served as a subject for famous Hudson River School painter Thomas Cole. The falls make you work for that view. To reach the base of the falls, you have to hike a half-mile up the gorge below. It's not crazy hard, but it's not a stroll. The falls are still a popular spot. On a nice weekend day, don't be surprised if you have to wait for a parking spot in the lot just west of the trailhead on Route 23A. Important: This can be a dangerous spot if you're not careful. There have been a handful of deaths there over the last two years. Know of other good waterfall spots in/near the Capital Region? Please share! Two come to mind. From Henry Hudson Park in Selkirk, you can kayak to one down the tributary just slightly to the south of the park. It's nice to catch the spray on a hot day. Also, at Albany Rural Cemetery, there is a small hidden waterfall. The Huyck Preserve has started work on a new 6.5 mile trail that goes through the northern 1,200 acres of the Preserve. You can come out and get a sneak peak of the trail during our up coming Community Volunteer Trail Day on Saturday, October 2nd, 9am to noon with BBQ to follow. Meet right at 9 at 284 Pond Hill Rd. Rensselaerville (the Eldridge Research Center). FWIW: Kaaterskill is almost entirely dried up right now. I was up there last month and it wasn't more than a trickle, which was disappointing. Also, yeah, be careful. It's pretty easy to lose your footing if you're not watching. 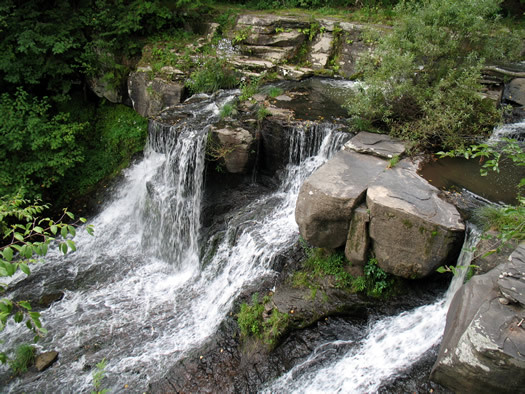 There is also an easier, shorter hike to the top of Katterskill Falls (great view!). From there you can quickly hike down to the bottom but it can be very steep and dangerous, however worth it to see the many caves on the way down. There used to be (~100 yrs ago) stairs going from the bottom to the top. You can still see and use the metal rings for holding onto bolted into the rocks on the west side (steeper) of the amphitheatre about 1/2 way down. And what about Christmans Sanctuary? There are lots of great falls around this area; I could go on and on. Don't forget the falls at Mine Kill State Park in Schoharie! Take a walk back in time on the famous Indian Ladder Trail. Learn about the geologic and cultural history of the Helderbergs as you descend the cliff to discover underground streams, caves, and fossils hundreds of millions of years old. Kind of stumbled across Plattekill Falls last year, it's not unknown but I think overshadowed by big sister Kaaterskill. It's just off Platte Clove Rd/County Rt 16. The section of Platte Clove Rd between W. Saugerties Rd and Rt 16 (all the same road really, hard to describe, look at Google Maps) is closed in the winter, so you'll have to come through Tannersville from November-April. There's parking on the side of the road near the Catkill Center preserve, or park in the Platte Clove parking area just down the road. The walk down to the falls is short but a narrow, cliffy trail. You can go to the bottom of the falls no problem but I wouldn't suggest going to the top at all -- there's a series of something like 8 falls, but they can all be treacherous. A really beautiful area, I stumbled on it by taking a wrong turn on the way to Overlook from Platte Clove, and glad I did. The Platte Clove parking area is the trailhead for Huckleberry Point and Kaaterskill High Peak, which can be combined in for some nice day hikes -- Huckleberry is really quick, KHP a little tougher with no official trail to the peak, a rock scramble on one of two approaches, with the bonus of an old airplane wreck right on the trail. Gorgeous views on both. For a long day, Overlook can be done as an out and back from there too, that trail is really nice with a few bluestone quarries on the way. And I really love stopping at Selena's in Tannersville for breakfast. Dinner in Saugerties (New World!) or Catskill after a hike makes for a great day trip. There are many other nice falls in the area with short hikes to get to including High Falls in Philmont, Diondehawa Falls near Greenwich, Mt. 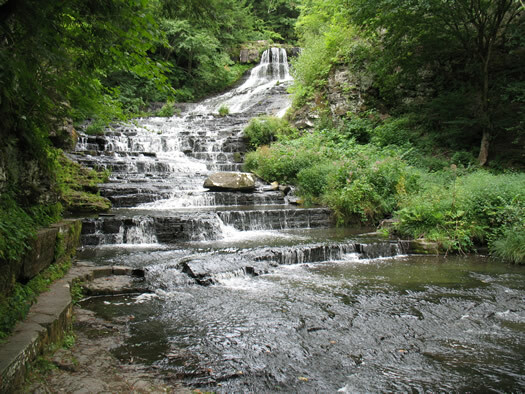 Ida Falls in South Troy, Minekill Falls Schoharie County, and Awosting Falls near New Paltz.